Sometime in 1980, the Theater of the Living Arts in Philadelphia put on a triple feature of John Waters’ films: Pink Flamingos, Female Trouble, and Desperate Living. At the time, I was living with Stuart Horn, a noted collage artist and sometimes punk-pop singer (who incidentally wrote the Romper Room theme song, and a bunch of lyrics for Sesame Street and other PBS children’s shows). Stuart said I had to see Waters’ movies, and I warily came along. I thought of myself then as an artsy outsider, but I was essentially a middle-class child of academics, who smoked a lot of weed, played in bands, and dabbled in various countercultures in West Philly and its environs. The Waters movies were profoundly shocking to me. I had never seen anything remotely like them. The closing scene of Pink Flamingos, utterly irrelevant to the plot, in which Divine eats dog feces, I found incomprehensible and very uncomfortable. It revealed a deep-seated English prudishness I didn’t know lived in me. In 1980, John Waters was a cult figure, unknown to most Americans. This was before his gentle arc towards the mainstream, beginning with 1981’s Polyester. The same year Stuart took me to see Waters’ films, TLA also repeatedly screened Eraserhead, David Lynch’s 1977 weirdo masterpiece. While Lynch’s film had bizarre characters and situations in spades, there was something artsy and elevated about its tone. Waters, on the other hand, delighted in the opposite of elevation. His characters (and the actors who portrayed them) were working class, and in some ways very ordinary – extreme versions of people you could find in many parts of the country. They were driven to extreme actions by extreme predicaments. And they were in some sense outsiders, outcasts. But their world was small and ramshackle, there was no grand ambition or self-importance in their stories, just a need to survive as themselves. 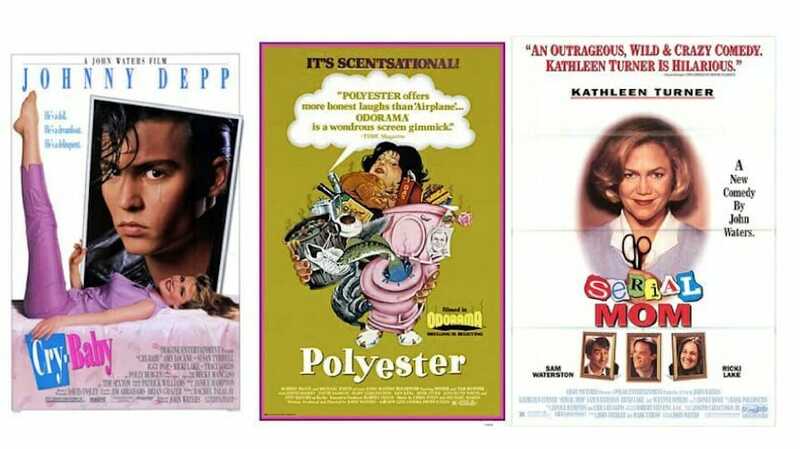 Beginning with Polyester, and more so with Hairspray, Cry-Baby, Serial Mom, and Pecker, Waters’ work moved into the regular cinemas, out of the midnight and art-house showings. Hairspray became a career-changing phenomenon, spawning a Broadway musical and a film based on that production, both of which were hugely successful. Waters’ work in this period involved less dog poop and egg-based gluttony, but it maintained a focus on the bizarre choices and quirks of life-sized people in ordinary circumstances. Even as Kathleen Turner’s Serial Mom becomes more and more extreme in her murderous endeavors, she remains in most respects a completely ordinary suburban housewife – just a really, really, crazy one. By navigating his way into mainstream cinema, I believe John Waters played a pivotal role in the mainstreaming of much related filmmaking, particularly the work of directors who focus on the small, the mundane, and the not-ready-for-primetime. Mumblecore, for example, is generally far less tacky and extreme than even Waters’ later work, but it shares a lack of virtuous larger-than-life heroes, a lack of plausibly threatening villains, and a lack of faithfulness to conventional plot arcs. Perhaps independent film was bound to achieve inroads into popular culture, given changes in technology and the expansion of alternate methods of promotion. But in the actual history we have to look back on, I suggest that John Waters crucially mainstreamed the small, ordinary, weird people and moments that had largely been on the margins in American film culture. He put them front and center, and movie-making is far richer for it. Photo Credit: Fair use images of movie posters for Serial Mom, Cry-Baby, and Polyester.